There are a number of considerations that will need to be taken into account before we could allow your project to take place. Risk Assessments: You will need to provide a comprehensive risk assessment. As the car park will have a high turn over of moving vehicles, your risk assessment will need to clearly outline what measures you intend to put in place to safe guard the safety of pedestrians. The risk assessment will need to be approved by the City’s Environmental Health Department to ensure it meets the required standards. Traffic Management Plan: You will need to provide a traffic management plan that will outline the signage you intend to use to manage traffic and pedestrian flows within the car park. Stewarding Plan: Your plan will need to show the stewarding arrangements you intend to put in place (such as directional advice to visitors). This will be required to ensure the safety of the car park users and any visitors to your exhibition. Planning Permission: You may need to apply for planning permission as there will be a temporary change in use of the car park. I would therefore recommend you seek early advice on this. Noise: You will need to consult with Tower Hamlets Environmental Health Service (Noise Pollution team). They will need to be reassured that nearby residents will be not be adversely affected by the noise, and that you have a procedure in place to deal with complaints and objections should they arise. 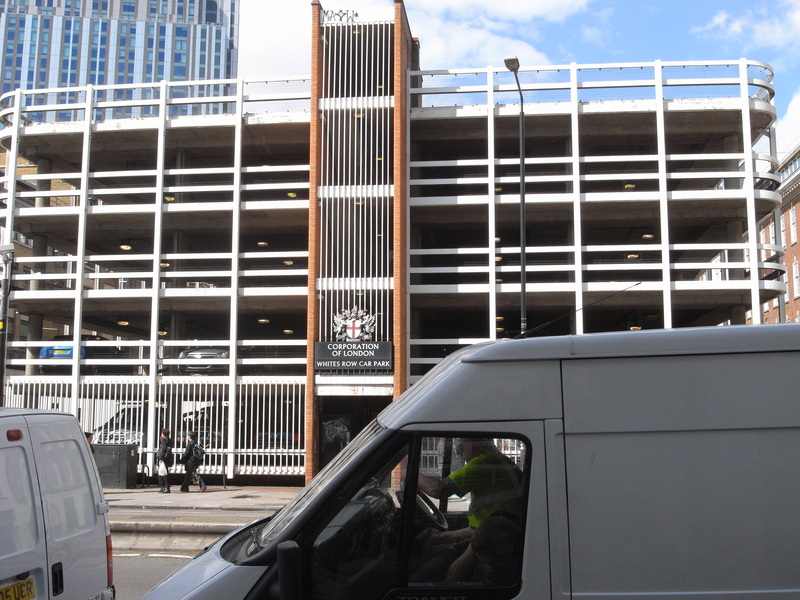 Indemnity: You will be required to indemnify the City against any damage sustained as a result of your temporary occupation of the car park. The cost of this is currently £300. Public Liability Insurance: As the City’s Public Liability insurance does not cover such activities in a car park you will need your own liability insurance; a copy of the insurance certificate will be needed for the City’s insurers. 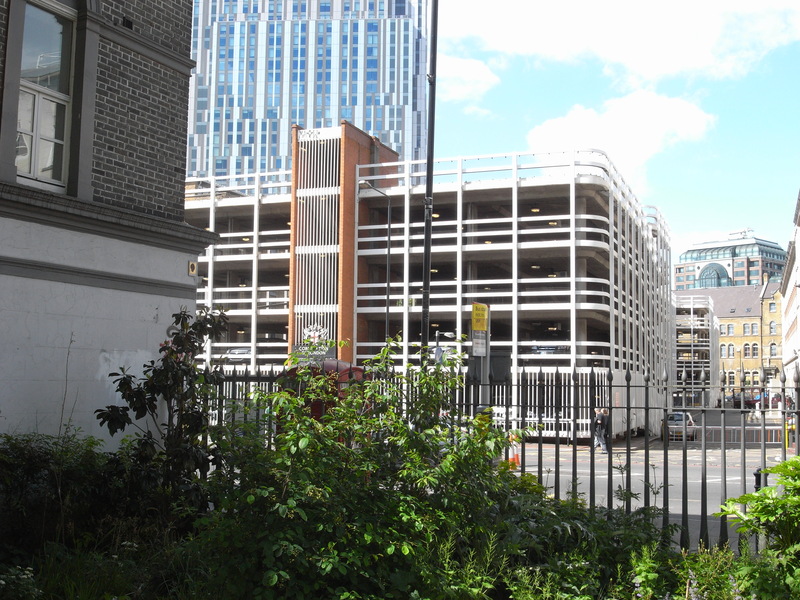 Parking Charges: There may be a cost incurred for the occupation of the parking spaces, which for White’s Row car park will be £28 per day per space. Concessions may apply if you are a registered charitable organisation. Cleaning: There may be a cost for additional cleaning as a result of an increase in footfall traffic. With regard to risk assessments, traffic management and stewarding plans, there are professional companies that can assist you with these. If you do not already have a company nominated, please let me know and I will endeavour to provide you some contact names and numbers. Once you have taken all the above factors into account, please contact me again so your request can be given further consideration. Unfortunately until we are in receipt of essential information such as risk assessments, insurance details and traffic management plans we are not in a position to say whether or not the car park can be used for your project. Hi Nida it’s Steve Thanks for your latest – I love your photographs.. you’ve gone undercover!! b) if so, perhaps the stencil could be like a ‘I heart NY’ t-shirt (ie just the I, a heart, and a U… might his help cross the linguistic barrier?? Thanks once again for getting this exchange up and posted on the blog. The last section about the Taweez being tied in the tree is very interesting. Would they be solely religious or could they have been tied there for other reasons? As I said I’m thinking of collecting the names of those who people would like to tell that they love them. Perhaps I could send those names to the shrine tree in Lahore and they could be tied to the tree as a symbol of the lengths we will go to for the ones that we love? 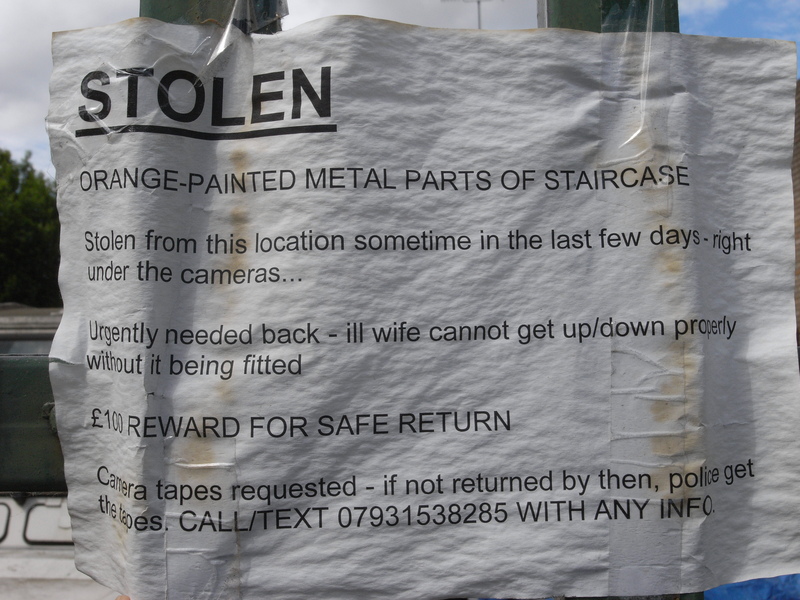 And perhaps you could send something in exchange, to be tied to the tree here in London?? 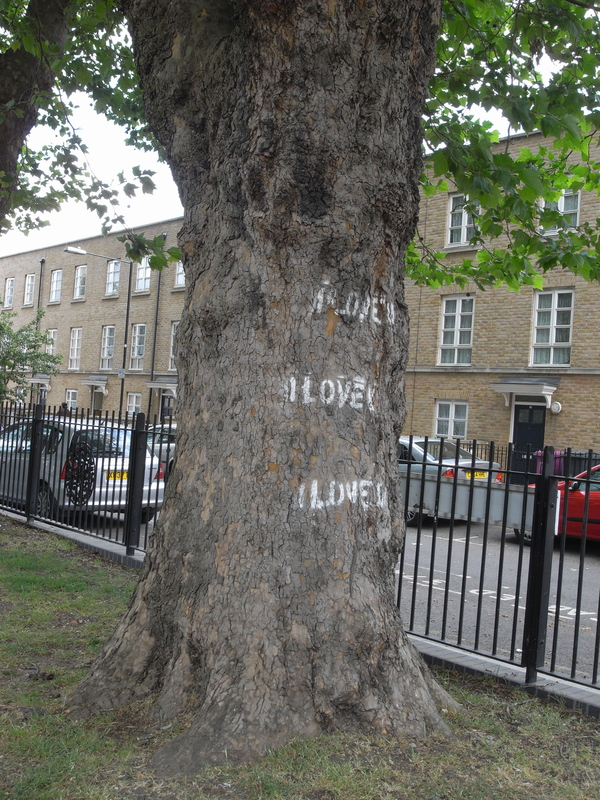 Although now looking at a picture of the I Love U tree (inserted below) all the branches are pretty high so that may be rather difficult (as my tree climbing days are not at their best! !…) but perhaps we could find a way of tying some Taweez to it in a cultural exchange. And whilst I am still considering the balloon idea that we’ve discussed previously, I am not sure how it could/should manifest itself (ie for what precise purpose, or whether, like love, it may be doomed to uncertainty and potential failure..) Maybe we could release balloons/a single balloon at both locations simultaneously…? 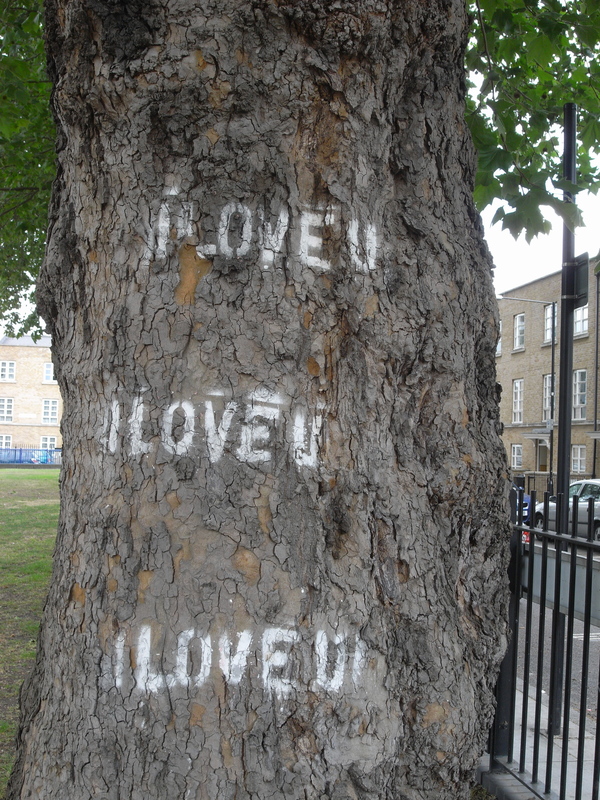 Or perhaps I could send something through the mail to the tree… Maybe I send you a replica stencil of ‘I LOVE U’ and you could stencil your tree with ‘I LOVE U I LOVE U I LOVE U’?? Responding to Sundays sun-soaked walk along the London Slice-line I’m now in possession of a handful of potential sites that will certainly need further investigation, and which could act as possible starting points towards making of a new piece of work. 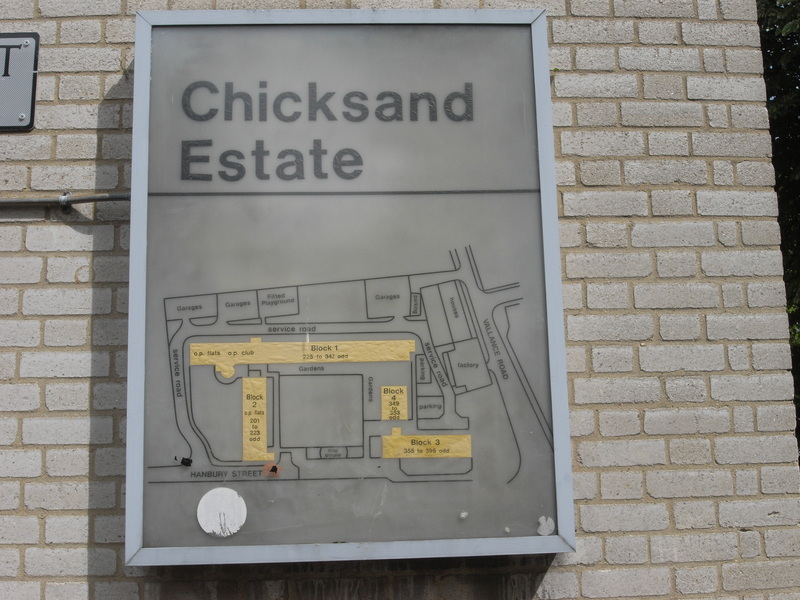 My third site is the electrical light-box estate plan located within the Chicksand Housing Estate (that runs along Hanbury Street towards Valance Road). Drawn to both the utilitarian nature of the object and the abstract hand-painted yellow rectangles, depicting the 4 various housing blocks, offset by the circular sticker residue – I may re-visit this site at night to see if the sign actually illuminates – and if so how that might change the objects dynamic. The final site is not illustrated here. Situated at the tail-end of the slice, heading east beyond the parameters of our slice-line, the work could become a directional street-furniture signpost, pointing towards ‘Wonderland’ (the now long-gone Yiddish theatre, with a colourful history of varied amusement, located around the corner from the end of the slice-line on Whitechapel Road). Considering the number of artists engaged with the project that have had or continue to have a performative background, plus the notion of pointing off, somewhere not seen, beyond the confines of the slice-line toward a place of potential fantasy might yet prove both a starting point for some new work and a fitting end to the slices trajectory… Over the next month my research will be centered around the above locations yet may extend further onto other sites following return visits to the slice-line.